I enjoy a nice cup of coffee. I also enjoy eating some sort of baked good or cookie along with my coffee. Last year, we shared Nonni’s Biscotti Bites, mini-sized versions of the popular coffee-time snack. Today, we’re excited to introduce you to the new, thinner biscotti cookie – Nonni’s THINaddictives. Nonni’s set the bar high with the name THINaddictives. Not only would these new Almond Thin cookies have to be thin, but they’d also have to be good enough to keep people snacking. 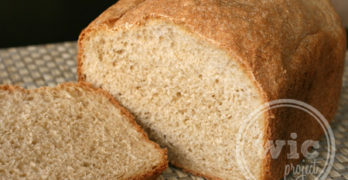 I can attest to the fact that Nonni’s THINadditives are both thin and completely delicious. Three tasty flavors. I think Pistachio is my fave….or maybe Cranberry. For my first tasting, I started with the Nonni’s THINaddictives Pistachio Almond Thins. I loved the blend of the soft (yet still kind of crunchy) texture of the THINaddictives cookies, contrasted with the crunch and hint of saltiness that comes from the pistachios. The next day, I tried the Cranberry Almond Thins. Again, the texture of the twice-baked almond thin is great. It has the familiar flavor of biscotti, but is easier to bite and a slighter softer texture (more cookie-er) than traditional biscotti. The cranberries really added a nice pop of sweetness. 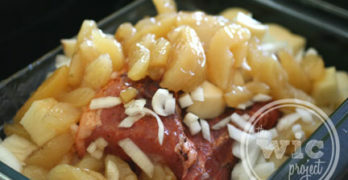 Almost like eating a crispy cinnamon roll with raisins, but way healthier. I thought the Cinnamon Raisin Almond Thins reminded me of cookie versions of cinnamon rolls. You can really taste the sweet cinnamon that combines with the flavor bursts of raisins. 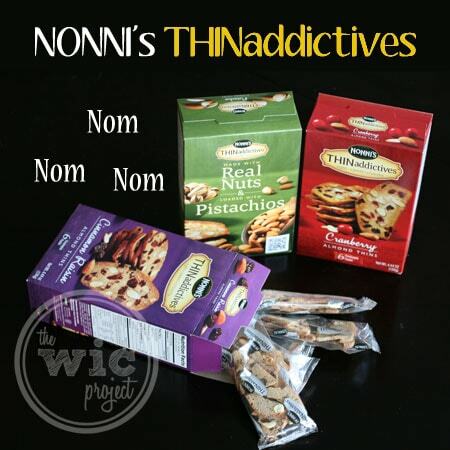 Nonni’s THINaddictives come in convenient, pre-portioned packs that are just 100 calories each. They’re perfect for throwing into a purse or backpack to take with you on the go or to just eat from the bag while you’re having a cup of coffee, tea, or milk. THINaddictives are also low fat (4g or less) with 0 grams of trans fat, making them a great option for healthier snacking. Nonni’s, the premier biscotti baker, is proud to introduce THINaddictives to its line of premium cookies. These artisan Almond Thins are as nutritious as they are delicious, with antioxidant rich ingredients baked into every bite. One winner will receive the new Nonni’s THINaddictives. I want to try Pistachio Almond! i would love to try any of them, but the pistachio almond sounds so goo! thanks for such a yummy giveaway! I want to try Cranberry Almond Thins. I’d like to try the cranberry almond. I would like to try the Pistachio Almond Thins! I’d like to try cranberry almond. I would love to try them all but especially their Cranberry Almond. I want to try the Pistachio Almond Thins. Definately Pistachio almond. Sounds great. I want to try Cinnamon Raisin. I want to try the Pistachio Almond Thins! 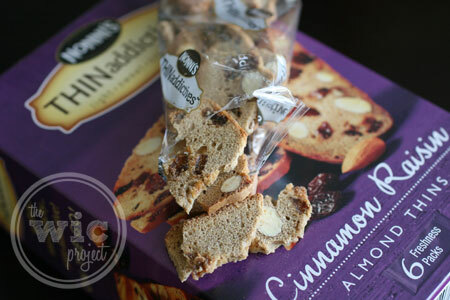 I want to try the Cinnamon Raisin Almond thins. The Cinnamon Raisin Almond Thins sounds yummy!! I like to try Cinnamon Raisin Almond. I am most interested in the Cinnamon Raisin Almond variety. I want to try cranberry almond. The Pistachio Almond ones would probably be my favorite. I would love to try the Pistachio Almond Thins. I want to try Pistachio Almond Thins. I’d like the Cinnamon Raisin Almond Thins. I would love to try the Cranberry Almond Thins! I would like to try the cranberry.